The early years - Signe Wilkinson was born in the depths of the baby boom and graduated from her suburban Philadelphia high school about the same year the SAT scores began their slide. After acquiring a BA in English from a western university of middling academic reputation, Wilkinson was unprepared for real work ... so she became a reporter, stringing for the West Chester (PA) Daily Local News. She also worked for the Quakers, Academy of Natural Sciences of Philadelphia, and with a housing project in Cyprus, a job that ended with a bang when a coup d'etat was followed by a military invasion from Turkey. Since then, Wilkinson has felt that a little multi-culturalism goes a long way. Early cartooning - Back in the newsroom, Wilkinson began drawing the people she was supposed to be reporting on. She realized cartooning combined her interests in art and politics without taxing her interest in spelling. After a year of remedial art school, including a stint at the Pennsylvania Academy of the Fine Arts, she freelanced at several Philadelphia and New York publications, finally landing a full-time job at the San Jose Mercury News in 1982. After 3 1/2 years on a steep learning curve, Wilkinson repaid her long-suffering Mercury News editor by taking a job at the Philadelphia Daily News, where she has been drawing contentedly ever since. Her work is recognized for its unique style and famous irreverence. Her awards include the 1992 Pulitzer Prize (the first woman to win the prestigious award), the 1991 Berryman Award, the 1997, 2001 and 2007 Overseas Press Club Award and the 2002 and 2008 RFK Award. Her most cherished honor was being named "the Pennsylvania state vegetable substitute" by the former speaker of the Pennsylvania House of Representatives in 1989. In addition to her editorial cartoons, Wilkinson draws the comic strip Family Tree, a groundbreaking family comedy that draws on Wilkinson’s wit (and her years of close personal experience with teenagers). Wilkinson has also drawn Shrubbery, a hybrid comic strip/editorial cartoon that focused on both the botanical and political landscape plus mulch-based cartoons for Organic Gardening magazine, other gardening related illustrations , mortarboard-based cartoons for the Institute for Research on Higher Education and water-based cartoons for the University Barge Club newsletter. " Wilkinson values her intensely unremarkable family life which is marked by her interest in growing outdoor lilies, killing indoor orchids and finding an easy way to match her husband's socks. See recent additions of Signe Wilkinson's Editorial Cartoons. See recent additions of Shrubbery. 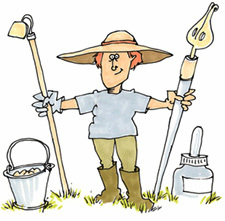 See recent additions of Signe Wilkinson's Gardening Images. Search all of Signe Wilkinson's work.